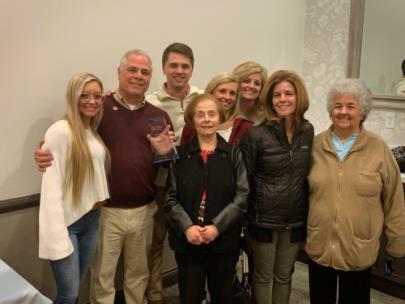 Robert Backer has been named 2018 Realtor of the Year by fellow real estate professionals with Greater Chattanooga Realtors. The award was presented at the association’s recent Installment and wards Reception at the Edwin Hotel. The Realtor of the Year award is given to a realtor in recognition of his or her contributions to the real estate industry, the community, and the local and state Associations. Mr. Backer has not only been an active member of the association, but continuously and consistently participates in civic activities to better causes in Greater Chattanooga while encouraging and inspiring others to do the same. Mr. Backer has increased his real estate expertise by earning many special designations, including the ABR, CRRS, NHS, and e-Pro. Mr. Backer has served on many local association committees including Professional Standards, Grievance, and Leadership Development. He is an active member of not only the Greater Chattanooga Realtors, but also Tennessee Realtors, as well as the National Association of Realtors. Mr. Backer volunteers with Habitat for Humanity, Snack Packs, Toys For Tots, and the Ronald McDonald House. Robert is married to his wife Jennifer, and they have a son, Jake. “Robert is a quiet leader who is always working hard for our association and profession,” said Kim Bass, 2018 Greater Chattanooga Realtors president. I am extremely proud of our Realtor of the Year, and this honor is well deserved,” said Bass.